Located at 45 km from Cagliari and immersed in a huge park with a luxuriant vegetation where the colours and the scents of the Mediterranean join together in order to create a magical atmosphere of peace and harmony. 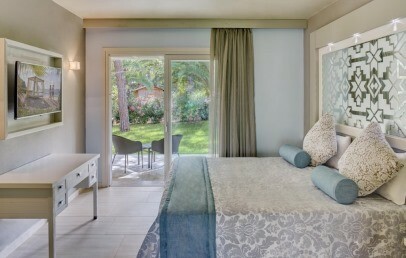 Hotel Le Palme is one of the hotels of the Forte Village Resort located very central. Centrally located, Le Palme is a 4* hotel immersed in a green forest of pine trees and surrounded by high palm trees and flowers of different colours. It enjoys a very good position close to the Oasis pool area, the Bike World, the Academy Sport Centre and the Piazza Luisa. A bit more farther is also the pool area Baia delle Palme and the Leisurland. Le Palme is ideal for everyone as well as for families with up to 3 children. All Bungalows are modern and equipped with comforts as air conditioning, Wi-Fi connection, LCD TV, minibar, safety box, mostly with bathtub and shower. Special decor for children’s bedrooms on request and extra charge (Barbie™). 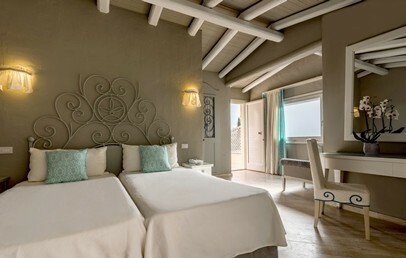 Le Palme Roof – 26 sq.m., double or twin room located on the first floor with a bathroom with tub and a balcony. 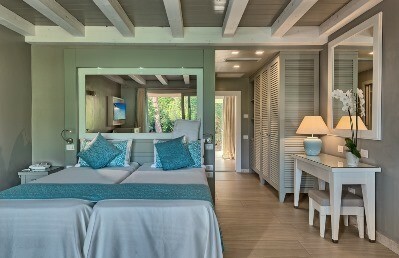 Bungalow Deluxe – 24-30 sq.m., with double bed or two single beds, bathroom with tub and separate shower and patio. A child bed can be added on request. Ideal solution for 2 adults and 1 child. Deluxe Family Bungalow – 35 sq.m., these bungalows have two rooms, separated by a sliding door. The master bedroom with bathroom with tub and shower and the living room with a sofa bed (2 beds for children). A private patio on the outside. We recommend this accommodation to families with 2 adults and 2 children under 13 years. The addition of a cot is not advisable due to lack of space. Deluxe Family Plus Bungalow – 44-49 sq.m., this bungalow has two communicating double rooms, each with its own bathroom (one with shower, other with tub and shower) and a patio. One room is slightly smaller and has two beds in an “L-shape”. This accommodation is ideal for families (with 2 adults and 2/3 children under the age of 13 years) who look for separate entrance and two bathrooms. Deluxe Family Play Garden Bungalow – 31 sq.m., composed of two separate rooms: a master bedroom with bathroom with tub and shower and a living room with a double sofa bed convertible into two beds for children. Private garden equipped with children's toys and surrounded by a wooden fence. Luxury Family Bungalow – 44 sq.m., this type of bungalow has two rooms, separated by a sliding door. The master bedroom with bathroom with tub and shower and the living room with a sofa bed, convertible into two beds or, on request, it can be replaced by two single beds. A cosy outdoor area with private patio embedded in the perfumed garden. This accommodation is ideal for a family of 2 adults and 2 or 3 children under the age of 13 years. The Acquafort SPA is considered the most famous Thalassotherapy centre of Sardinia. Dipped in a wonderful garden of various colours and particular for its mediterranean scents, this centre guarantees to its guests an unforgettable experience of delight and relax. It offers treatments with marine elements (water, sand, algae), 6 pools of marine water with different temperatures, different types of massages, herb teas for all tastes and uses. A team of experts of the wellness is at the complete disposal of its guests, able to create for them personalized itineraries of wellness and ready to lead them toward the recovery of their psycho-physical balance for a deep regeneration of the spirit. The guests of Le Palme Hotel can have breakfast at the Oasis Restaurant. Further restaurants open for dinner are the following, with a supplement, not included in the half board, table reservation required: Belvedere, Cavalieri, Le Dune, Forte Gourmet, Terrazza San Domenico, Hell’s Kitchen. Forte Village Resort offers to its guests a wide range of services and sport activities for all tastes and ages. You have the impression to stay in a little paradise where all your wishes become true in such a easy way that you will be left speechless. It can be practiced various sport activities as there are: 12 tennis courts all with artificial lighting, 3 football fields with stands and a regular grass field, 1 modern full equipped gym, various water sports, scuba diving and a 18-holes Golf Club, Is Molas Golf Club, at 8 km away. It also has 10 swimming pools, 2 of them are for children, located in different sides of the resort area. For the shopping lovers the Resort offers a variety of boutiques where are to find all the prestigious griffes of the Italian fashion. These are all concentrated in the promenade alongside the Piazza Luisa, where you can also find the chauffeur, the kiosk and the jewellery. In the evening the square becomes a meeting place, where take place different entertainments that fit for adults as for children. City tax – the municipality of Pula requires the payment of € 1,50 per person/overnight to be paid on spot. Children under 12 years, disabled people and their assistants, business travellers and students are exempted. Double room located on the first floor in a cosy bungalow not far from the beach. Bathroom with bathtub. Nice garden view balcony. Ideal for 2 people. Spacious accommodation elegantly furnished. A child bed can be added on request. The bathroom has tub and shower. A nice patio leads out to the garden of the hotel. This is an ideal accommodation for 2 adults and 1 child. Spacious accommodation with modern and elegant furnishing. This type of bungalow has two interconnecting rooms, a double bedroom with a sofa bed (upon request) and a smaller twin room with two single beds in “L-shape”. 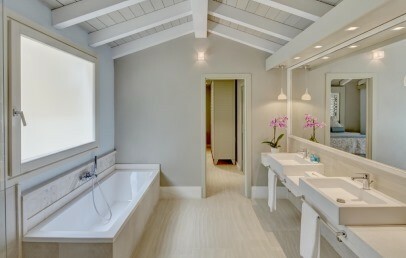 Each room has a private bath (one with shower, the other with tub and shower), a patio and an independent entrance. An ideal solution for families of 5 people (2 adults + 3 children under 13 years or 2 adults 2 children + 1 cot). On request and with a supplement the Barbie™ themed child’s accommodation is available. This bungalow has two rooms, separated by a sliding door. 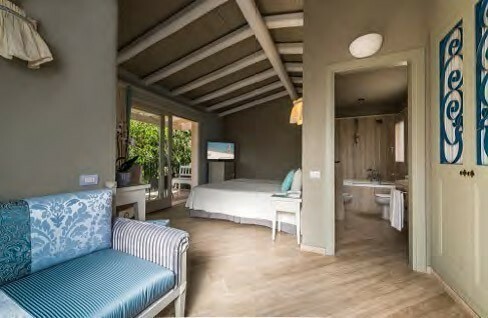 The master bedroom with bathroom with tub and shower and the living room with a sofa bed (2 beds for children). 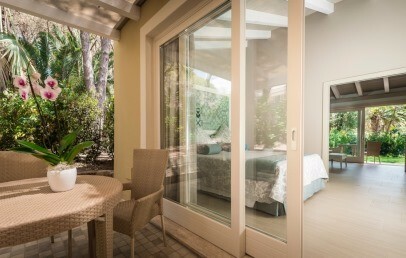 A private patio leads out to the hotel garden. We recommend this accommodation to families with 2 adults and 2 children under 13 years. Adding a cot is not advisable due to lack of space. COMBO 6 – Special Offer for Families! 10% reduction + max. 2 children up to 12 years old free of charge in the room with their parents. Bookings confirmed within April 30th 2019. COMBO 7 – Special Offer for Families! Max. 2 children up to 12 years old free of charge in the room with their parents. Bookings confirmed within April 30th 2019 (stays from July 7th to 26th).